A substantial movement is sweeping through the travel and hospitality industry, as hotels and restaurants are using mobile messaging to engage customers. However, many more businesses are still on the outside looking in – not quite sure of how SMS would fit into their existing strategies. But don’t worry; this is an easy problem to fix. At OpenMarket, we recently sponsored and published an IDC InfoBrief on the state of mobile messaging in the travel and hospitality industry. The data was thought-provoking and should interest all businesses within this growing sector of the market. Perhaps the most interesting takeaway is the fact that 82 percent of travel and hospitality companies believe mobile messaging has a “considerable” or “major” impact on the ability to increase revenues. It’s not all about the bottom line, though. Nearly 90 percent of respondents believe mobile messaging has a “considerable” or “major” impact on overall customer experience. Out of all the possible uses of SMS, survey respondents overwhelmingly believe that the biggest impact mobile messaging can have on the industry is related to one of the following five issues: attracting and retaining customers; differentiating or improving the customer experience; gaining deeper customer insight; global communications; and enhancing multichannel delivery capability. When looking at the travel and hospitality industry, hotels represent a hefty portion of the market. As such, we believe it’s valuable to look at some of the specific ways in which hotels can use – and are currently using – SMS to engage customers. As the industry becomes increasingly competitive, many of the major hotel chains are attempting to differentiate their value offerings by customizing guest experiences to feel more personal. One way hotels do this is by leaving a welcome note in guests’ rooms upon arrival. These simple notes are nice, but they aren’t all that personal. As an alternative to leaving notes in a guest’s room, hotels could send welcome messages via SMS. These messages should be brief, personal, and helpful. An example would be, “Welcome to The Hotel, John! We hope you enjoy your stay with us. Please don’t hesitate to reply to this message if you need anything.” They can then respond with something like, “Thanks! Could I get a couple of extra towels?” By including the guest’s name and giving them a quick and easy option for responding, they’ll feel more at ease. When a guest places a reservation over the phone or online, an SMS service could send an automated text message to the user with all of their details and information. This eliminates confusion and ensures confirmation details don’t get lost in a crowded inbox. Hotels can also use this opportunity to ask users if they want to upgrade their room or extend their stay. One area where we’re seeing a lot of growth in this industry is with concierge services. Rather than having to wait in line at the service desk or place a phone call, SMS provides a direct line to concierge. From requesting fresh linens to ordering room service, this service can really help guests feel at home. If you’re wondering how this progressive concierge concept works in the real world, check out this article about some of the first hotels to incorporate it a couple years back. 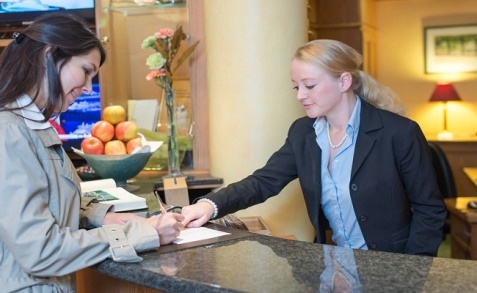 Finally, hotels can use SMS to automate and streamline the checkout process. Instead of slipping invoices under the door or requiring guests to swing by the service desk on the morning of checkout, SMS checkout messages can be automatically sent with very little hassle. Not only is this easier on the hotel, but it also gives the guest one less thing to worry about or figure out at departure. Outside of hotels, restaurants represent the second most active SMS demographic in the travel and hospitality industry. Here are some of the specific ways in which mobile messaging is being used. Much like reservation confirmations for hotels, reservation reminders are extremely helpful assets for restaurants. They are typically sent a few hours before the reservation to remind the individual of when to arrive, where to park, and more. It’s even possible to throw in some details, such as daily specials and weather forecasts. Many retailers are fond of sending mobile coupons via SMS, and it’s caught on with restaurants, too. By sending coupons in the middle of the week, it’s possible to attract more customers during slow days. Restaurants should be wary of sending too many offers and deals, but an occasional, well-timed coupon can pay dividends. One of the biggest challenges for restaurants is getting customers to opt-in to SMS communications. A great way of encouraging customers to subscribe is to offer contests and promotions. This provides an incentive to sign up and can kick a slow SMS strategy into high gear. Finally, surveys are a great way to gain valuable insight and feedback from your users. In order to leverage surveys, restaurants should include a short message on receipts that reads something like, “Text SURVEY to 1234 to tell us what you thought about your dining experience.” This won’t produce massive results, but the occasional feedback can prove valuable. At OpenMarket, we’re on the cutting edge mobile engagement. That’s why four of the top ten global brands use our mobile engagement services to engage their customers and employees. For more information on mobile engagement, SMS, and how these technologies fit into the travel and hospitality industry, please reach out to us today!